Expectations are high for Providence’s versatile frontcourt. Blue Ribbon, hailed as college basketball’s “bible,” ranked PC’s frontcourt as the best in the Big East in its preseason rankings. Earlier this fall, Friarbasketball.com took in-depth looks at both Nate Watson and Emmitt Holt, specifically why Holt was such a terrific offensive option two years ago, and how Watson progressed during his freshman season. While Watson and Holt figure to carry the offensive burden on the interior, Ed Cooley will have options at his disposal. Here’s a look at Providence’s expected interior contributors. Kalif Young: Beauty is in the eye of the beholder with Young. His detractors pointed to his struggles at the free throw line as a freshman, and his inefficiency as a back-to-the-basket scorer last year (Young was below average at .514 points per possession with his back to the basket as a sophomore), but the junior big man has significant value. 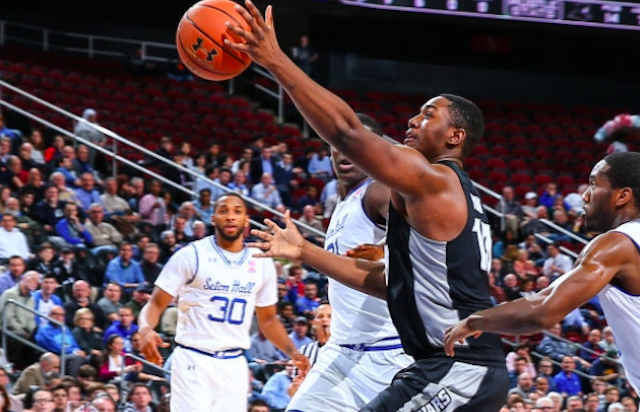 He’s already started 30 games for the Friars and turned himself into a more-than-serviceable rebounder and defender over the past two seasons. While he shot just 26% on post-up opportunities, Young is excellent when running the floor for a 6’9, 250 pound center. His 1.615 points per possession in transition opportunities ranked him in the 99th percentile in the entire country last year. His free throw percentage jumped from 37% as a freshman to nearly 50% last year, while he shot 54% from the field overall, flashing a face-up jumper during his sophomore campaign. Young proved to be a decent passer as a freshman, but opponents will more likely dare him to beat them with his scoring than passing. To focus on offense is to miss Young’s value to PC. He does the dirty work. Young figures to be Providence’s best rebounder (4.1 rebounds in 16 mpg in 2016-17) and interior defender. 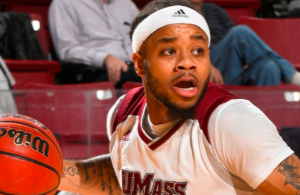 He’s a great complement to Watson, who could be one of the elite post scorers in the Big East this season. Prior to Young’s freshman year, Cooley said he thought Young could become one of the best rebounders in the league before he graduated. 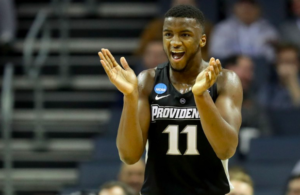 Providence figures to get more rebounding help from a bigger backcourt this season, but if Young controls the glass he should see substantial minutes on a team with rebounding question marks. Jimmy Nichols: There’s a lot of buzz in Providence circles about the 6’8 forward from Conway, SC. Nichols is young, having turned 18 in July, but he’s already made a big impression in practice and summer workouts on campus due to his athleticism and skill set. If you haven’t seen Nichols play, he’s a lean, long-limbed forward who gets off of the floor quickly and can shoot it well for a player his size. He had five blocks in just 21 minutes in Providence’s exhibition game against Bowie State, and showed little hesitation in pulling the trigger when left open beyond the arc in the exhibition opener. Like Holt, Nichols projects as another inside-out big man who can draw defenders to the 3-point arc, while also defending the rim. Expectations are high for Nichols. Isaiah Jackson: Listed as a guard on the team’s official roster, Jackson is a strong 6’6, 225 pound wing who could see time as a small ball 4 depending upon the matchup. We saw him take advantage of smaller defenders in a March win against St. John’s in 2017 (18 points on 8-10 shooting), but he was particularly effective last year against Marquette and Creighton when playing as a small 4 who caused slower big men fits. Jackson finished with 19 points and seven rebounds, while getting to the free throw line ten times, in an overtime loss against Marquette, and he torched Creighton’s big men in the second half of a critical January win (11 points and nine rebounds). 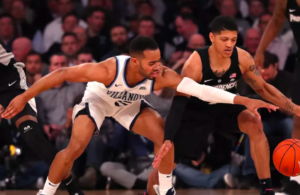 He had nine points and nine boards when PC and Creighton met again in the Big East Tournament Quarterfinals — another Friar victory. With his experience, the 23 year old Jackson will find his way onto the floor as either a physical wing or a matchup 4.
can’t wait for Tuesday 11/6 be there GO FRIARS !